Order Ritchies Homebrew Starter Kit from the Stirling Homebrew Shop UK. 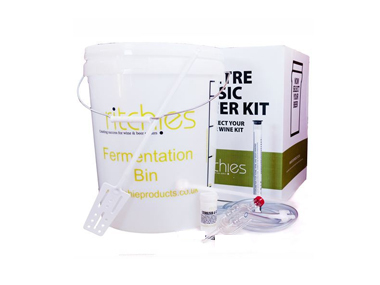 Buy Ritchies Basic Beer Starter Kit and other Homebrew Accessories safely online in the UK. This beer starter kit contains everything you need to make your own beer. Can also be used as a wine starter kit. Just select your own wine or beer kit to go with it. This beer starter kit contains everything you need to make your own beer. Can also be used as a wine starter kit. Just select your own wine or beer kit to go with it. All you need to add is a wine kit or beer kit of choice! Where to buy Ritchies Homebrew Starter Kit safely online? Shop at the Stirling Homebrew Shop if you are wondering where you can buy Ritchies Basic Beer Starter Kit safely online in the United Kingdom. Homebrew Starter Kit - Ritchies Basic Beer Starter Kit in Homebrew Accessories and Homebrew.